Skip Intro's discussion thread on the official Stardew Valley forums is the best place to post feedback or suggestions, or ask for help. Feel free to post below if you don't want to create an account there. Skip Intro 1.8.2 is now available! This just updates it for the upcoming SMAPI 3.0. It's great! Simple, but great! Thanks. * Updated for Stardew Valley 1.3.29. Skip Intro 1.8 is now available! * Updated for Stardew Valley 1.3. * Added support for skipping to the co-op join or host screen. * Changed default to title screen. * Updated for changes in SMAPI 2.6-beta.16. 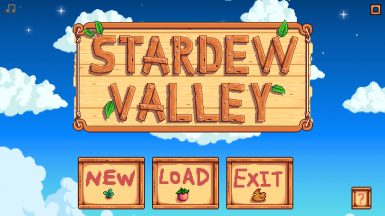 * Fixed skipping to host co-op screen (broken by a recent Stardew Valley update). * Fixed game freeze after getting disconnected from multiplayer. Ok but what is the config values for skipping to the host screen now? I got "HostCoop" and "JoinCoop" but "HostCoop" gives me an error but still launches and brings me to the join screen instead of the host screen. They recently changed the menu, so now there's a 'connecting to services' phase. I'll look into that for the next update. Thank you for the swift support! Fixed in the upcoming Skip Intro 1.8-beta.2. Skip Intro 1.7.2 is now available! This just updates to the latest SMAPI 2.4 to fix a deprecation notice. The mod is faster than that, since it also speeds up the transitions. * Clicking the bear thing twice: 13 seconds. * Pressing ESC at the first logo: 5 seconds. * Skip Intro: 2 seconds. I didn't have a config.json file in the mod folder, but I made one in Notepad and it worked fine. Contained the following, for anyone else that wants to do the same. The config.json file should be created automatically the first time you launch the game with the mod.